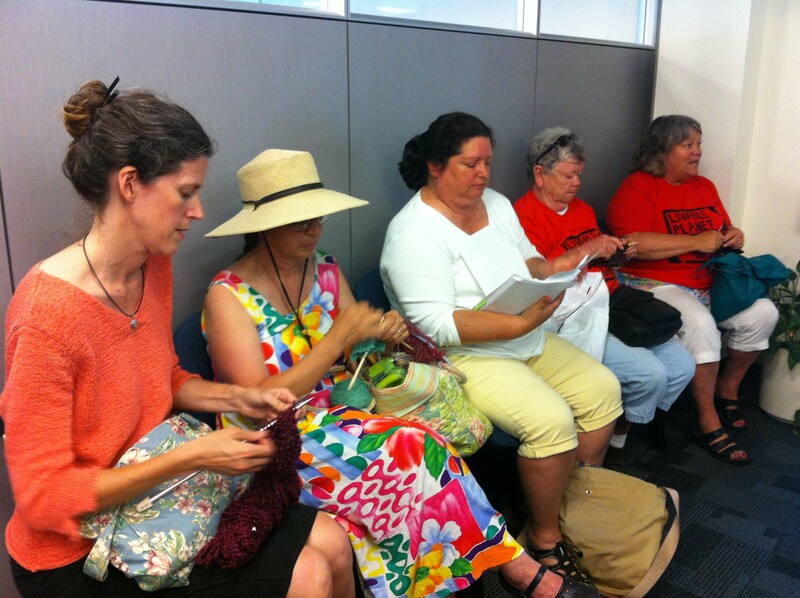 Rebecca Foster, Jane Palmer, Maren Vasatka, Claire Broughton and Mary Martin stage a "knit-in" at Vermont Gas headquarters in South Burlington. South Burlington police on Wednesday night arrested Jane Palmer of Monkton at the Vermont Gas headquarters after Palmer — a landowner who lives along the route of a proposed, hotly debated pipeline that would carry natural gas to Addison County — refused to leave the building after business hours. There wasn't any banner waving, sign toting or political theater at the afternoon's protest, as was the case in late May at a larger event; this time, it was just five women, knitting needles in hand, camped out in the lobby of the Swift Street business. They'd come requesting a meeting with Vermont Gas leaders to raise several concerns — among them alleged trespassing on the part of Vermont Gas employees on private property along the pipeline route. The protestors — who included Palmer, Claire Broughton and Maren Vasatka of Monkton, Mary Martin of Cornwall and Rebecca Foster of Charlotte — also expressed deep frustration with the way Vermont Gas dealt with protestors in the past. They pointed to the charges of trespass leveled against Henry Harris, Will Bennington and Sara Mehalick after a May 27 protest. Vermont Gas alleged the protestors assaulted a company employee at the event; protestors maintain it was a peaceful undertaking. Sitting in the gas company lobby, Palmer said she was "appalled and incensed" after watching one of the arraignments following that event, and in a statement the women accused the company of using "scare tactics" to fend off dissent. "By over-prosecuting, by coming on so strong, it makes people people wary to get involved," said Foster. 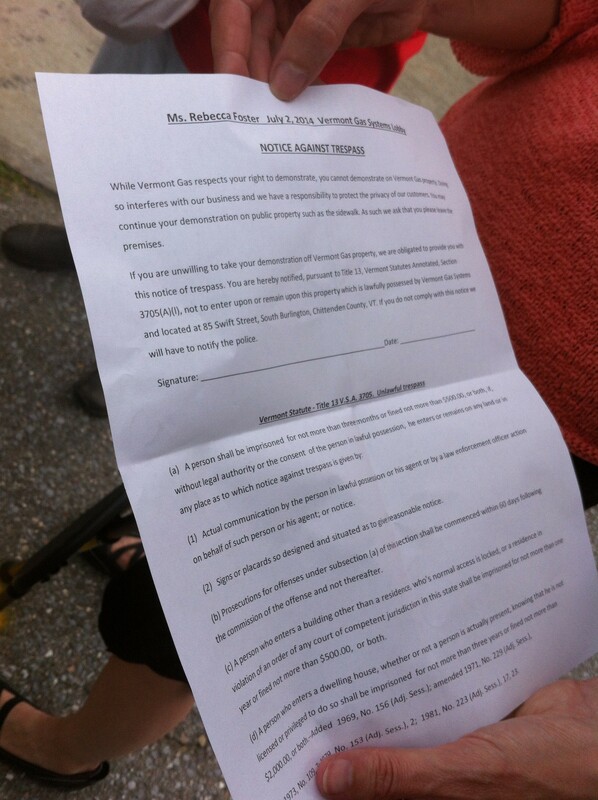 Rebecca Foster displays the official notice against trespass issued against the protestors. They called their protest a "knit-in." Speaking more broadly, the women returned to a consistent refrain of complaints about the pipeline project, raised over the last two years by residents along the route and environmentalists across the state. Those complaints include concerns about the environmental toll of using "fracked" natural gas; the behavior of Vermont Gas officials and contractors; and the concerns of landowners who feel railroaded by the gas company and ignored by regulators. Foster said that after participating "beautifully" in the process — writing letters to the Public Service Board, to local newspapers and speaking up at public hearings — the small group felt compelled to make their concerns known. "We're reluctant activists — because they've forced us to be," said Martin, whose Cornwall home is along the proposed route of the second phase of the pipeline project. "Nobody is listening, and that's why we feel we have to make a point," said Palmer. "This is what it's come to." Five p.m. arrived, and with it the official closing hours for Vermont Gas. Vermont Gas employee Tom Murray stepped into the lobby, requesting the group — and the assembled band of reporters — to leave the building. Reporters and photographers were nudged outside. Several police cruisers eventually arrived. After being issued formal warnings against trespass, Martin, Foster, Broughton and Vasatka — along with a supporter filming the event — voluntarily left the building. But Palmer stayed on. According to South Burlington Chief of Police Trevor Whipple, Palmer was cited with trespass, and taken to the South Burlington police station. Martin, visibly frustrated and upset, wagged her finger at one police officer behind the wheel. "Shame on you," Martin said, as the cruiser glided away with Palmer, in a floral sundress and straw hat, sitting in the back seat. Steve Wark, Vermont Gas Spokesman, was not available for comment on the protest. The afternoon's protest came on the same day that Vermont Gas announced that higher-than-expected material costs — as well as increased project oversight and additional construction inspectors — were bumping up the cost of the first phase of the Addison Rutland Natural Gas Project by an additional $35.6 million. The updated cost of the pipeline project now stands at an estimated $121.6 million.